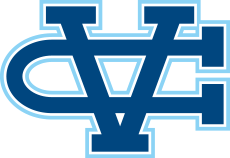 San Jose, CA - “Up and coming.” We hear that a lot in today’s sports talk but in searching for an adequate description of the youthful Valley Christian men’s track & field program there is nothing more fitting. The Warriors have been on an upward trajectory the past few seasons, highlighted by a strong core of younger athletes that are now coming into their own. Last season the Warriors qualified an athlete to the WCAL Final in every event. The team went on to finish third in the Frosh-Soph division at the WCAL Championship. With a range of talent potentially scoring across every discipline the Warriors look to climb the league standings in 2016. Albert Caruana of crosscountryexpress.com and contributor to milesplitCA has jokingly dubbed Valley Christian “Shot Put City.” Humor aside, it is for good reason. While the girls have no doubt dominated at the State and National level the boys are not far behind. Theodore King, who went on to play football at BYU is just a few years removed from his school record of 53 feet, 2.25 inches in the shot put. And it was just two years ago David Maumalanga punched his ticket to the state championship with a throw of 52-11 that earned him a second place finish at the CCS Championship. That year Fa'auli Gaoteote also nearly cracked the 50 foot barrier with a toss of 49-1. Those three marks the are atop of the school’s all-time list and some of the best in CCS history. Looking to make his own mark on the record books is junior Dylan McCreery. Last season was his first and his debut as a sophomore was impressive. He finshed the season with a second place at the WCAL final in the frosh-soph division. His toss of 47-8 is just 3.5 inches shy of TK’s frosh-soph school record. McCreery no doubt is on his way to becomong one of the best in school history. It was a pair of freshman school records for Daniel Machado last season. His toss of 42-0 in the shot put and 99-9 in the discus is a strong debut. Sophomore Max Moore was impressive in the discus as well, throwing a season best 130-4, which stands #6 on the team’s all-time list. Jonathan Wick is a junior in his first year a the shot put and ended with a personal best 41-1, which stands #8 all-time. Matthew Weeks is one of decathlete types who does it all… and is good at it. He was a finalist in the 300 hurdles and often a contributor in the 4 x 400 relay. While he is good at the running stuff he has excelled at the jumps. Week’s is the defending frosh-soph WCAL Champion at the high jump and was a top finisher in both the triple jump and the long jump. 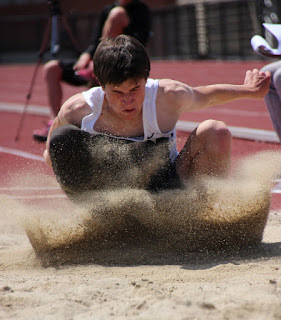 As a sophomore he hit season best of 19-7 in the long jump which is #8 all-time for the Warriors. His triple jump of 42-0.5 stands at #7 all-time and his high jump of 5-10 is tied for 6th in the record books. The Warriors welcomed Coach Gittens to the fray last season and the results were immediate. 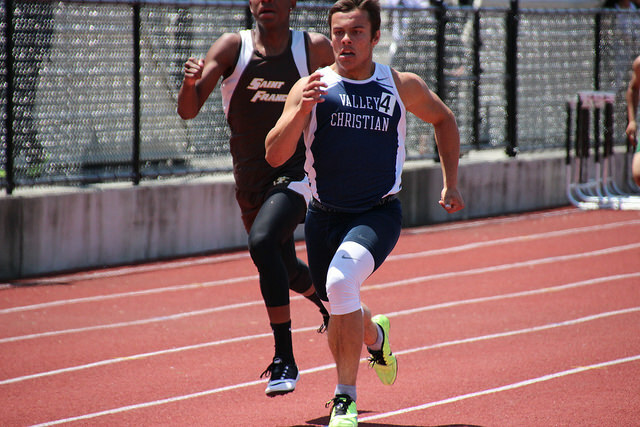 Trent Laubach led the sprinters last season winning the WCAL title at 200 meters (Frosh-Soph) with an impressive 22.87 showing. His mark is #9 all-time for the Warriors for wind-legal marks. He also finished the season with a season best of 11.23 for 100 meters, the #13 best mark on the team’s all-time list. It was an impressive performance from the core of youngsters last season, in addition to Lauback, Nick “the Quick” Trofort was a finalist in both the 100 and 200 meters where he finished top 5 in both. Trofort ended the season with season bests of 11.38 for 100 meters and 23.74 for the 200, respectively. 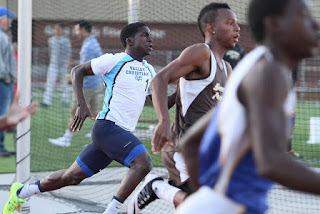 Gary Coleman was another freshman who was a big contributor in the sprints, he finished the season just as impressive running season bests of 24.40 for the 200 and 54.41 for 400 meters. Jonathan Sum led the hurdle crew in 2015, finishing the season with a season best 9.65 for the 65 hurdles, a mark that earned him a top 3 finish at the WCAL Frosh-Soph championship. He also competed at the 110 hurdles at the varsity level for dual meets; his time of 17.17 is #4 all-time for Valley Christian. Sum was also a WCAL finalist for the 300 meter hurdles. Matt Weeks, a top scorer in the field events also was a WCAL finalist at 300 meter hurdles, finishing the season with a season best of 43.75 which is #6 on the team’s all-time list. Will Bainbridge also gave the intermediate hurdles a try and ended a WCAL finalist as well. If season best mark of 44.50 is #8 all-time for the Warriors. The distance crew will be comprised of a strong core of returners that are coming off an impressive cross country season. This fall the Warriors finished second place in CCS, qualifying them for the State Championship. Five of the scoring runners finished the season running in the 16 minute range for 3 miles. They also went on to set a team record on every course they competed on this season. Nedu Ndili is the top returner for the distance events this season. Last season as a sophoore Ndili posted outstanding performances of 1:59 for 800 meters and 4:32 for the 1600 meters. Ndili also was a key contributor on the 4x400 meter relay team that finished the season with a mark of 3:39. Joe Renati had a breakthrough at last year’s WCAL Final winning his heat of the 3200 meters. Renati had a strong showing as a freshman, hitting marks of 4:46 for the mile and 10:35 for the 2 mile, respectively. 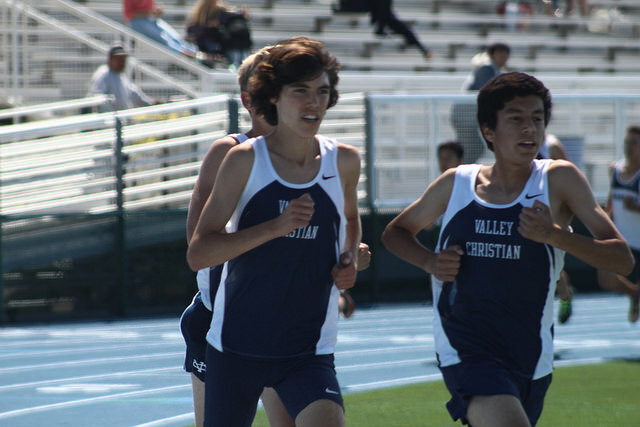 Renati is coming of a stellar cross country season where he was named Valley Christian’s “Runner of the Year” after he led the Warriors to their first state meet appearance in school history. 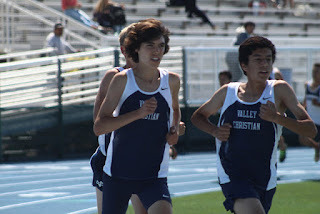 The distance crew will have impressive depth this season as Justin Baraona and Sam Cuevas will once again be counted on to contribute at the varsity level. Baraona ended last season with season bests of 4:51 and 10:32. Cuevas finished 2015 with season best of 4:56 and 10:41. After two seasons of playing baseball Cameron Lockard has committed to a full season of track this spring and will be a welcome addition to the team this spring. Dean DeMoss and Peter Enfantino return for their senior year and add depth to a strong distance squad. DeMoss finished the season with a season best of 2:08 for 800 meters and 4:47 for the mile. Enfantino finished the season sub 5 in the mile, 10:51 in the 2 mile and is coming off a strong cross country performance competing on the State Championship team. The Warriors open their season March 5th at the Willow Glen and Dan Gabor Invitationals.